This past week Tim and I decided to try a new sushi restaurant in downtown Victoria BC. The restaurant is called Gozen which means big meal or good meal. It certainly was a good meal. Tim and I thought that it was some of the best modern sushi we have had in Victoria since we moved here four years ago. We went for lunch so we ordered the lunch specials. Tim had the sashimi special and I ordered a salmon bowl. The presentation was spectacular. Not only was it a fest for the belly, but also a fest for the eyes. The staff was knowledgeable and friendly. They answered all our questions and were open to us vlogging our experience in the restaurant. 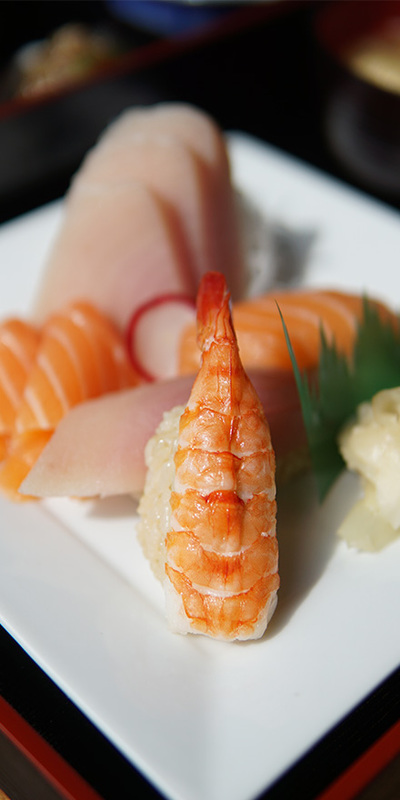 Gozen offers many touches that are above and beyond. Their home made soy sauce is delicious. I often leave sushi restaurants with headaches and dying of thirst from the soy sauce, but this was not my experience at Gozen. I chock it up to the homemade soy sauce. It could have also been the way they prepare their sushi rice. The rice looks brown but that is because they use a red vinegar which is naturally sweet. The texture of the sushi rice is perfect – not slimy or wet at all and perfectly balanced – not to vinegary or sweet – they don’t need to use sugar because the vinegar is sweet. Careful how you use your chopsticks when you go for sushi. Never stand your chopsticks up in a bowl of rice. During funerals in Japan, a bowl of rice with upright chopsticks is placed before the coffin of the deceased. So you could see why you wouldn’t want to do this. While we are on the topic of funerals. You also do not want to pass your sushi with chopsticks. Instead put a piece of sushi on a plate and pass it that way. Why? This also has to do with the deceased from a funeral. There is another ritual at Japanese funerals where the deceased bones is passed between each other using chopsticks. 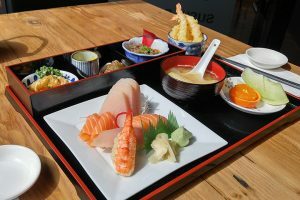 You are only supposed to use your chopsticks to eat sashimi, not sushi or maki. Also don’t scrape those chopsticks that is considered rude. If there are splinters, just ask for another pair. Did you know there is a proper order to eating your sushi? Start with the light fish and move on to the richer more oily fish. Did you know that miso soup is not the traditional first course of a sushi meal? In Japan it is more of a breakfast food. In Japan people traditionally start their sushi meal with tamago, the Japanese style omelette to determine the skill of the chef. Salmon is actually a white fish. It gets its colour from crustaceans. Fish with orange flesh have generally been feeding heavily on ocean crustaceans like krill. Maku Sushi (the sushi rolls) get its name from the mat used to roll it. We hope you enjoy this sushi muckbang of Tim and I sharing some sushi etiquette and fun facts about sushi. If you like our food vlogs and would like to see more of them please be sure to subscribe, give the video a thumbs up and share this video with your friends. Leave the comment, “maki me more sushi videos” in the comments if you would like us to go back to Gozen Sushi Bar Izakaya in Victoria BC to review their specialty rolls.